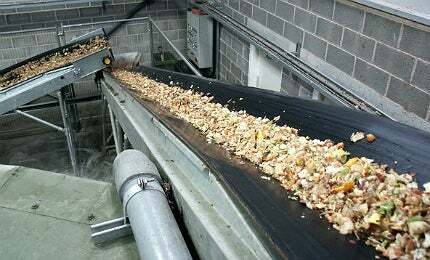 Green energy proponents in the UK recently celebrated the milestone of achieving a one million ton food waste milestone, with more than one million tons of organic waste being processed into energy annually. Dr Nicola Davies caught up with a recent push to integrate waste to energy projects into the UK's future energy mix. Tilbury B power station was converted from coal to 100% biomass fuel, using sustainably-sourced wood pellets. In the UK waste-to-energy projects illustrate a constant increase in capacity and success as the amount of processed waste increases each year. The amount of processed waste increased to 7.2 million tons in 2010, up from six million in 2009. Image courtesy WRAP UK. The UK is also seeking to triple the amount of renewable and combustion technologies used from 1.2 terawatt-hour (TWh) to 3.6TWh by the year 2020. Electricity from biomass is predicted to grow rapidly globally, according to the world’s largest market study on electricity from biomass by Cologne-based ecoprog. The reason for this rapid growth is that, during the next five years, as many as 820 biomass power plants will be operationalised globally, each plant having a capacity of 12.5 gigawatts (GW). While Europe will remain the largest market, China, India, and the US are expected to experience the largest growth. To illustrate the extent of the predicted growth, during the past five years, about 150 biomass power plants each year were operationalised worldwide, each with an average output of 11 megawatts (MW); by 2016, it is projected that 165 plants with an average capacity of more than 15MW will be operationalised yearly. "While Europe will remain the largest market, China, India, and the US are expected to experience the largest growth." The benefits of waste to energy on the environment are immense. Processing waste into renewable resources not only produces heat, energy and fertilisers, but also reduces the use of landfills and the release of methane gas. Furthermore, increases in renewable electricity output provide evidence that waste-to-energy initiatives are significantly benefitting the UK’s economy. Reports from the Department of Energy and Climate Change (DECC), which has offices in London and Aberdeen, presents output from the second quarter of 2012 showing a 6.5% year-on-year rise in renewable electricity. It is believed that this increase can be attributed to the operation of a number of large-scale wind farms, as well as the conversion of the Tilbury B power station from coal to 100% biomass fuel using sustainably-sourced wood pellets. As a result, the share of renewable energy in the total production of electricity has increased from nine to 9.6%. A spokesperson from the power plant says: "We believe that biomass could have an important role to play in the future UK energy mix. Biomass is a dispatchable technology, meaning it has the ability to produce an exact amount of low carbon energy quickly and on demand." With efforts such as this, the UK is on the verge of setting new records for renewable energy conversion. While the developed world seeks to efficiently deal with renewable resources through recycling and reducing consumption of non-renewable resources, the UK in particular has further plans to preserve the environment. Traditional waste to energy practices are being replaced with waste-to-energy projects that include a combination of corporate waste strategies and the conversion of food waste into renewable resources, such as energy and fertiliser. As a result, the use of anaerobic digestion, a series of processes that breakdown biodegradable material in order to manage waste or release energy, has increased in the UK. "The benefits of waste to energy on the environment are immense." Recent figures reveal that the UK has been successful in achieving a one million ton food waste milestone, with more than one million tons of organic waste being processed into energy and fertiliser in anaerobic digestion plants annually. According to the reports authors, the Banbury (England)-based Waste and Resources Action Programme (WRAP), a non-profit organisation with the vision of a world without waste, waste-to-energy projects illustrate a constant increase in capacity and success as the amount of processed waste increases each year. Indeed, the amount of processed waste increased to 7.2 million tons in 2010, up from six million in 2009. It is believed that the significant increases and success observed in this sector can be attributed to the support received from the UK Government and from WRAP, which includes a £10m loan towards anaerobic digestion technology. Two-year trials, running until March 2014, are currently being conducted by WRAP to establish new markets for the use of digestate (a by-product of anaerobic digestion) in the landscape and regeneration sectors. "Recent figures reveal that the UK has been successful in achieving a one million ton food waste milestone." Field experiments examining the viability of using digestate will explore its potential use as sports turf, energy crops and soil improvement for use as habitat creation, sports fields and allotments. These trials will be running alongside WRAP’s Digestate & Compost in Agriculture project, which is a four-year project examining the use of digestate and compost in agriculture. The Digestate & Compost in Agriculture project is jointly funded by the Department for Environment, Food and Rural Affairs (Defra) in London, WRAP, WRAP Cymru and Zero Waste Scotland. The project has been designed to gather data to enable recycled organic materials, such as quality digestate and compost, to be used more efficiently by farmers, helping to reduce waste costs and improve production. A vital objective of the project is to make the results accessible to farmers, hence the development of a strong programme of knowledge exchange to deliver the findings to this population. Agricultural colleges make up part of this programme, providing farmers with the knowledge and skills required to maximise the potential of quality digestate and compost. Since London is currently the hub of waste-to-energy projects, it is the government’s aim to expand waste-to-energy projects to other cities throughout the country. The UK also seeks to triple the amount of renewable and combustion technologies used from 1.2 terawatt-hour (TWh) to 3.6TWh by the year 2020. "Indeed, the amount of processed waste increased to 7.2 million tons in 2010, up from six million in 2009." However, in order to achieve this target it is important for the government and residual waste agencies to create and disseminate relevant policies regarding waste to energy initiatives, in order to gain maximum confidence and support from the public. It will also be necessary for the government to provide support and funding for the waste to energy industry to enable its development. As demonstrated within the farming sector, the future of waste to energy projects in the UK will have a strong emphasis on education and collaboration with industries that can drive these projects forward. A recent example of such collaboration is the development of a guide, by WRAP, for businesses wishing to develop smaller-scale energy from waste facilities. The long-term goal is not to replace recycling, but, according to Ian Wardle, head of energy from Waste for WRAP, to recognise that "not everything can be recycled and recovering energy from unavoidable residual waste may be preferable to landfill." 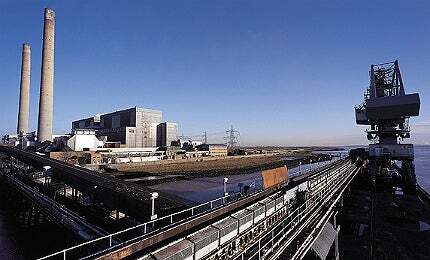 Tilbury Power Station is situated in Essex on the banks of the River Thames, about 25m east of London, UK. Wartsila’s two biomass-fuelled combined heat and power (CHP) BioPower 5 CEX plants were commissioned in May 2009 at the premises of its Manchester and Tadcaster facilities. RWE Innogy’s UK subsidiary RWE npower renewable is building a biomass-based combined heat and power (CHP) plant to supply power to a paper mill owned by Tullis Russel in Markinch, a small town in Fife, Scotland.